v4.1 adds support for Visual Studio 2017 RC4, enables the TrackEd add-in by default and adds missing style to show tab executing and debugging images in SSMS 2016. See the full what’s new list. Download the installer. I’m using VS 2017 Professional. 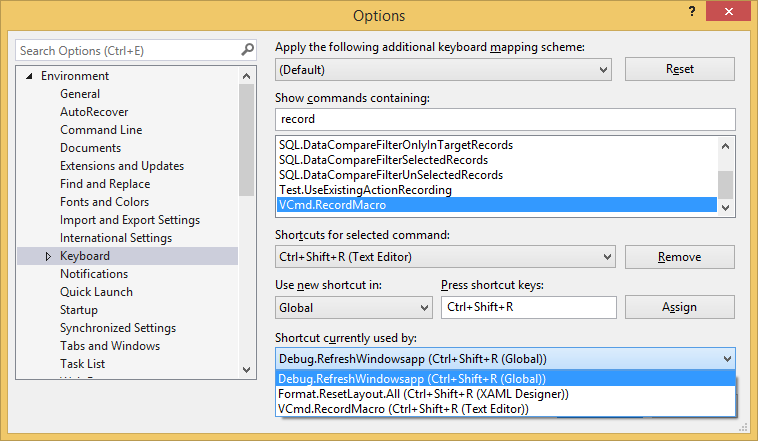 I tried using Tools->Options=>Environment=>Keyboard to assign Ctrl+Shift+R to VCmd.RecordMacro (globally). Even though the menu item VCMD=>Record Macro now shows that the assignment “took”, nothing happens when I use the key combination. Ctrl+Shift+P works, but not Ctrl+Shift+R. Most probably Ctrl+Shift+R is used by another command in a local context (like Text Editor) and takes precedence before the Global context. In this case you need to remove that command binding or assign Ctrl+Shift+R in the local context too. I already tried that, didn’t work. I’m wondering if this is a VS 2017 bug. Ctrl+Shift+R works for VCmd.RecordMacro correctly on my VS 2017 machine. Can you please install the Keyboard Shortcut Exporter extension (https://marketplace.visualstudio.com/items?itemName=MadsKristensen.KeyboardShortcutExporter), export shortcuts to a file and then check this file if any other command uses the Ctrl+Shift+R shortcut? Another option is to install the Learn the Shortcut extension (https://marketplace.visualstudio.com/items?itemName=MadsKristensen.LearntheShortcut), set Show on shortuct=True in Shortcuts options, press Ctrl+Shift+R and see what command will be displayed in the status bar.